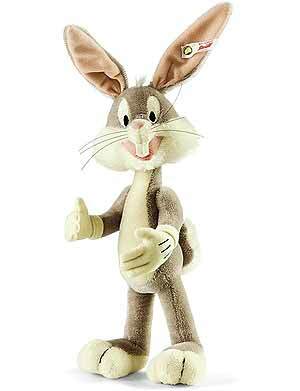 Bugs Bunny by Steiff. This beautiful hand made piece, in grey and white mohair is three way jointed, arms and head and wears the white ear tag, signifying this item as a Steiff limited edition, together with the famous gold plated Button in Ear. Limited edition of only 2000 pieces worldwide.